A magnificent holidays dinner with Paganini's own recipe for Ravioli with ragout! 1. Paganini's Ravioli (1839) Paganini and Rossini adored great cooking! 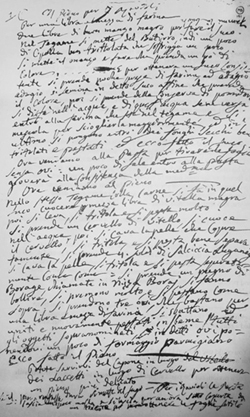 Here an original magnificent recipe personally written by Paganini: his own version of Ravioli with ragout! 1. Put the onion and the butter in a big casserole. When onion starts getting golden-brown, add the beef divided into 4 or 5 big pieces into the casserole. When the beef starts getting a bit golden-brown, add some spoons of flour onto the pieces of beef and turn them various times. Then pour the tomato sauce with a bit of water onto the pieces of meat and into the casserole. Stir the sauce and add the dust of mushrooms to it. Adjust salt, pepper and a bit of nutmeg to taste. Let the sauce gently simmer for various hours (ca. 4 or 6 hours). 2. Put the veal from heifer into the same casserole as the aforementioned tomato sauce. Let it cook there. When the veal is ready remove the piece of meat from the casserole. 3. Cook the brain from calf in some boiling water. When it's ready, clean the brain as usual. 4. Cook also the borage in some boiling water. When the handful of borage is ready, squeeze the water out of it. 5. Then put the cooked veal from heifer, the cooked and cleaned brain from calf, the handful of borage, the luganega sausage cut into pieces into a blender. Blend all the ingredients well until you get a smooth paste of meat. 6. Now put 3 eggs (with both yolk and white) into a casserole. Beat them and immediately add the smooth paste of meat. Stir the paste well. Add the grated cheese Parmigiano. Adjust salt, pepper and a bit of nutmeg to taste. If the stuffing is still too solid, just add some teaspoons of the tomato sauce you are cooking, until you get a solid but soft structure of the stuffing. 7. Now the stuffing for the ravioli is ready. 8. This particular dough for Ravioli is without eggs. So prepare a typical dough for pasta with 700gr. flour, a pinch of salt and enough water to get a good, smooth dough. Now work the dough with your hands. 9. If the dough is too solid, add then a bit of water, if the dough is too wet add a bit of flour until you get the best soft consistency. 10. It takes ca. 15 min. to create a perfect dough. You understand, when the dough is ready, because the dough appears smooth and its consistency is sufficiently soft. Now create a ball of dough, cover it in flour all around and put it in a bowl and cover the bowl with a piece of cloth. Or just leave the ball of dough on a wooden table under a dish. Let the dough rest for, at least, 1h. After 1h. the dough is ready. 11. Now cut the dough into 7 parts (1 part per person = 10 or 20 ravioli per person: it depends on the dimension you give to their shape). 12. Take 1 part, and, by using a rolling-pin, create a thin layer of dough (ca. 1 or 2 mm). It is better you give it a regular square shape. Now divide the layer of dough into 2 halves by using a knife. Take 1 half and put 10 small mounds of stuffing on the layer in 10 regular positions. Then cover the 1st half of the layer and the mounds of stuffing with the 2nd half of the layer of dough. At this point, by using the "speronella", create 10 ravioli (with a nice square shape)! 13. Now go on, until you have used all the 7 parts of the dough and you have created, at least, 70 ravioli (if you create a smaller shape, you can get even 140 ravioli, by using the same quantity of dough). 14. Cook the Ravioli as usual in salted boiling water (or broth/stock). When you see the ravioli reaching the surface of the boiling salted water and floating, they are ready. They don't usually take too much to be ready. 15. Remove the Ravioli from the boiling water and serve the Ravioli in dishes covered with the aforementioned tomato sauce with some small pieces of meat (cut from the 900gr. beef cooked in the tomato sauce) and some grated Parmigiano cheese onto them. Per una libbra e mezza di farina due libbre di buon manzo magro per fare il suco. Nel tegame si mette del butirro, indi un poco di cipolla ben tritolata che soffrigga un poco. Si mette il manzo, e fare che prenda un po’ di colore. E per ottenere un suco consistente si prende poche prese di farina, ed adagio si semina in detto suco affinché prenda il colore. Poi si prende della conserva di pomodoro, si disfa nell’acqua, e di quest’acqua se ne versa entro alla farina che sta nel tegame e si mescola per scioglierla maggiormente, e per ultimo si pongono entro dei fonghi secchi ben tritolati e pestati; ed ecco fatto il suco. Ora veniamo alla pasta per tirare le sfoglie senza ovi. Un poco di sale entro la pasta gioverà alla consistenza della medesima. Ora veniamo al pieno. Nello stesso tegame colla carne si fa in quel suco cuocere mezza libbra di vitella magra, poi si leva, si tritola e si pesta molto. Si prende un cervello di vitello, si cuoce nell’acqua, poi si cava la pelle che copre il cervello, si tritola e si pesta bene separatamente, si prende quattro soldi di salsiccia luganega, si cava la pelle, si tritola e si pesta separatamente. Si prende un pugno di borage chiamata in Nizza boraj, si fanno bollire, si premono molto, e si pestano come sopra. Si prendono tre ovi che bastano per una libbra e mezza di farina. Si sbattano, ed uniti e nuovamente pestati insieme tutti gli oggetti soprannominati, in detti ovi ponendovi un poco di formaggio parmigiano. Ecco fatto il pieno. Potete servirvi del capone in luogo del vitello, dei laccetti in luogo del cervello, per ottenere un pieno più delicato. Se il pieno restasse duro, si mette nel suco. Per i ravioli, la pasta si lascia un poco molla. Si lascia per un’ora sotto coperta da un piatto per ottenere le foglie sottili.